"A little About this Amazing Vehicle..."
than 100 additional HP as compared to the unrestricted 150-200 HP increase capability the 2004 Engine management System was able to produce. This is a major concern if wanting to take advantage of the many aftermarket power and mileage computer chips and programmers available for this engine. The best modules for this application are the SCT® power programmer or the Edge® dash board power controller. Both can be coupled together for maximum performance, mileage and shifting performance if desired. Therefore, I decided to purchase a brand new, top of the line, fully loaded 2004 Excursion. I purchased this truck in June of 2004 (the unlimited engine management performance gain allowance began in May, and most the earlier 6 liter block issues were solved at this point) with the intentions of having the best overall truck possible. I was not disappointed. Once realizing the potential of this model, I set out to build up a full featured yet tasteful package that would contain everything and satisfy almost anyone's needs, and tastes. This was completely achieved. This truck drives and rides better than any other Excursion off the show room due to all the upgrades and improvements I made. It steers perfectly, unlike many Super Duties have been known for. The truck is silent going down the road, no squeaks or rattles. Besides all the factory features and options, there are a lot of upgrades hidden on this truck, so I invite you to explore them on the "aftermarket upgrade listings" and "photo gallery" pages. I'm sure you will be impressed. The Excursion went out of production as of April 2005, and has enjoyed 5 full years of loyal followers that can not imagine life without one of these almost perfect trucks. With the size and strength of a Super-Duty pickup, the comfort and luxury of a Lincoln Navigator, and the overall performance dominating over it's next closest competitor, the Suburban... the Excursion is the king of the undisputed mountain. And with it's Diesel delivering fuel mileage that some mini-van's can't achieve along with the ability to tow what some 1-ton pickup's can't, all while hauling a family load of people, the "Big-X" as it's passionately referred to, does it all... and then some! 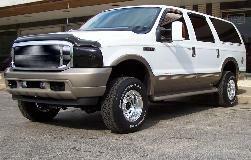 Interestingly enough, Ford's subsequent publications title the Excursion as a "collectors vehicle", probably because of it's uniqueness that the like of may never be seen again. While many thought the Excursion was discontinued due to poor fuel economy, owners can tell you a completely different tale as even their gasoline engined Excursions can rival the economy of the lighter, smaller and much less robust Expedition of the same year. Truth be known, the Excursion, even though a heavy duty 'truck' by all standards, is classified in emission standards as an SUV, which is getting tougher and tougher to meet EPA and CAFÉ requirements. The Excursion also takes away precious resources at the Super-Duty plant from producing more pickups which they desperately run short of as it is. Therefore, the big, lovable Excursion was the unfortunate victim of both governmental and logistical sacrifices. The Excursion is and most likely will always remain as the biggest and baddest SUV that has ever walked the Earth... and fellow "Big-X" owners will be quick to come back with a very prominent "oh, hell yeah!"